Tattoo Blog » A Tattoo Advertisement On My Forehead? Tattoo Blog » Ads » A Tattoo Advertisement On My Forehead? A Tattoo Advertisement On My Forehead? Not long after I got my tattoo Advertisement for Chilkoot Charlies on my arm, I was at it again searching for the next website or company to use my body as a billboard. I decided to Google tattoo advertising and see what came up. 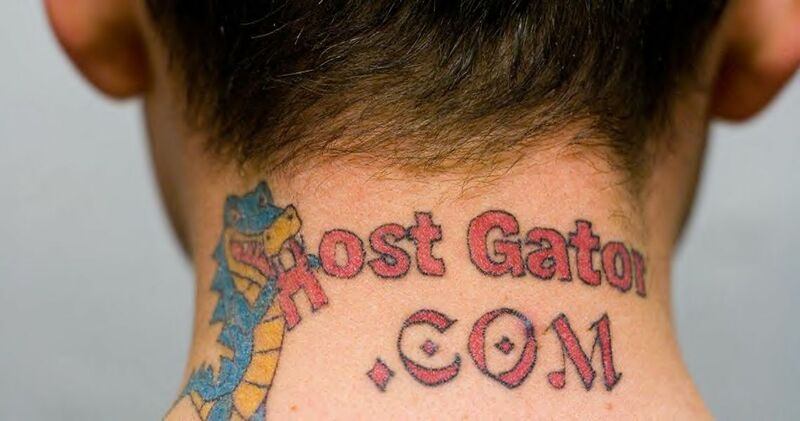 I found that a web hosting company a while back, tattoo advertised on the back of someone’s head. I started emailing as many web hosting web sites as I could. The owner of one of those websites emailed me back. It was the owner of Hostgator.com he was very interested. He wanted very much to tattoo advertise on my forehead. I was a little hesitant at first, but then decided that I wanted to do it. Since I already have several tattoo advertisements, why not go all out right? Something came up and he decided to advertise on my neck instead. So that is what we did. I now have a tattoo advertisement for one of the largest web hosting companies on earth on my neck. This was tattoo advertisement number 6. I am still searching for companies to tattoo advertise on my forehead and head, even my eye lids are available for advertising. The next company to tattoo advertise on me also choose to advertise on my neck, read about that tattoo in my next post.